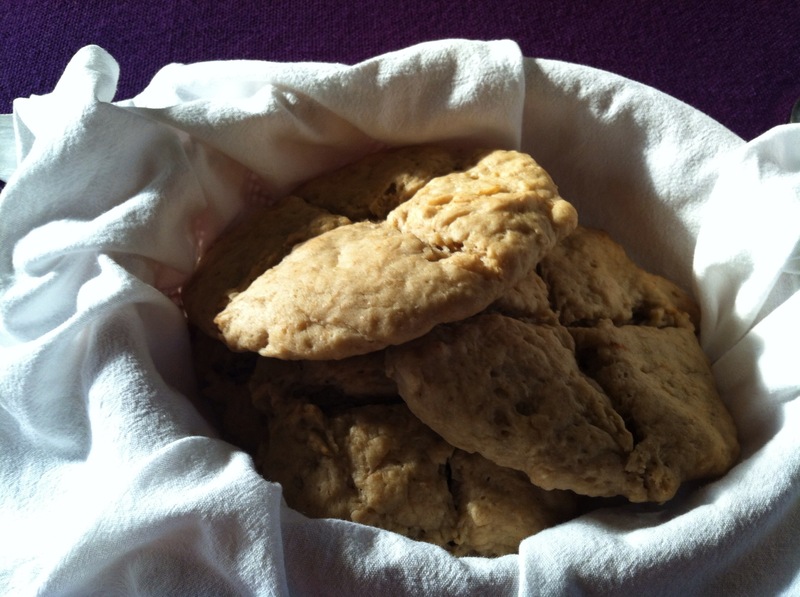 I have been working on a simple bread recipe for communion for most of the four years we have been attending seminary, and now just before we graduate, I am happy to post this recipe. I hope to follow-up with more information, so please ask any questions you have either in the blog comments or contact me directly. My requirements for this recipe included that it had to be not only gluten-free, but also free of all of the top allergens and preferably free of the common food sensitivities that many individuals with Celiac disease also seem to have. For these reasons I did not want to use a pre-mixed gluten-free flour blend. If you do decide to use such a blend, please look for one that is free of other allergens, and be sure to post all of its ingredients when you post the recipe you use for the communion bread you are serving. The bread also had to taste good (I have a tough crowd to please here as my testers) and be easy to work with when tearing it for communion. I think this recipe meets those requirements–and I would love to hear from you when you try it!. See detailed notes below the recipe as I begin to answer question! Psyllium husks (whole): 6 T.
apple cider vinegar: 1/2 tsp. Mix all dry ingredients in large mixing bowl. Mix well with a whisk, and leave a well for mixing in wet ingredients. Mix wet ingredients (oil, vinegar, water) in together and pour into dry ingredients. Mix well by hand for a couple of minutes until it comes together as a thick sticky batter. Remove from oven to again coat lightly with oil and re-score the cross if desired. TURN OVEN UP to 400 degrees and bake approximately 12 more minutes. Remove from oven and place the loaves directly on cooling rack. COOL COMPLETELY. This makes 4 loaves that are about 6 inches in diameter depending on how flat you make them. Below is a chart with half and double recipe amounts on it as well!! ½ cup plus 2 T.
Please use parchment paper. The parchment paper not only serves to keep the bread from sticking to some pan surfaces, but also is essential to keeping a gluten-free environment if you do not have a dedicated gluten-free kitchen. I realized after inserting it that I did not use parchment paper on the batch I took a picture of above, but that baking stone has ONLY ever been used for gluten-free baking (we keep an entirely gluten-free kitchen). If you use your pans for baking things with gluten, PLEASE use clean parchment paper to cover the surface of the pan as some individuals are sensitive enough to cross contamination that a speck of a crumb left behind could make a difference. I can currently find all of these ingredients in my local grocery store (although the psyllium husks can be trickier and I prefer to order the Frontier brand from Amazon; look in the health food and supplements section of the store as it is sold as a digestive supplement). I link to the items online for your convenience to see what the products look like, and am not endorsing any particular online place to purchase them. The best price continues to vary, but feel free to share in comments where you prefer to purchase your gluten-free flours. I have made many batches with the Bob’s Red Mill brand I linked to, but I have also used other brands of these particular flours. The Psyllium husks are essential to this recipe, and even ingredients with similar properties, such as flax seeds, have not given the same texture. I am experimenting with using less of it though. If you experiment and it works well, please leave a comment. This recipe was inspired by multiple recipes from food blogger Brittany Angell. You can order her wonderful cookbooks on amazon and follow her blog for many free recipes or to sign up for her recipe club. If you are new to gluten-free baking, I highly recommend her baking guides as they explain the properties of the various flours. 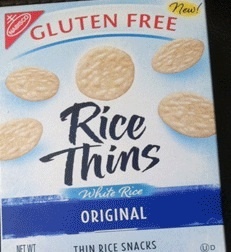 Serving size 7 crackers with 8 per box 56 crackers — for communion breaking into thirds is recommended (or at least half, but since I recommend thirds I will calculate that way). Calculation on 50 crackers per box (25 per sealed bag) to account for breakage, etc. The above two cracker options are my current recommendations for those that want to use something GF to replace communion wafers. These two options are relatively inexpensive and easy to find, and are preferable in both taste and texture to the GF wafer options currently available while remaining allergy friendly (avoiding the addition of soy or other allergen like found in so many other GF products). The following two products (really seems to be one product with different packaging although I cannot confirm that) are what I see available for a product specifically marketed as GF communion wafers. If you know of others, please leave a link in the comments area! These are available from many sources at a variety of prices. I will use the prices currently on their website for my comparison. Due to shipping these may be more cost effective if there is a local place you can purchase them. Currently many local supply stores as well as gluten-free specialty stores or sections of large grocery stores are carrying them. these break very easily and seem smaller than many communion wafers making them less than ideal for intinction. These seem to be identical to the Ener-g wafers, but packaged differently. I can not verify that because I have not used these wafers personally. Similar pros and cons would apply as above. The packaging here helps to prevent crushing; however, if you are not going to quickly use the entire container, there may be more waste. It is becoming more and more common to hear both pastoral and lay leaders call for inclusive communion practices as part of broader hospitality and accessibility ministries. My heart rejoices when I read or hear such calls for inclusion as found in this manifesto. 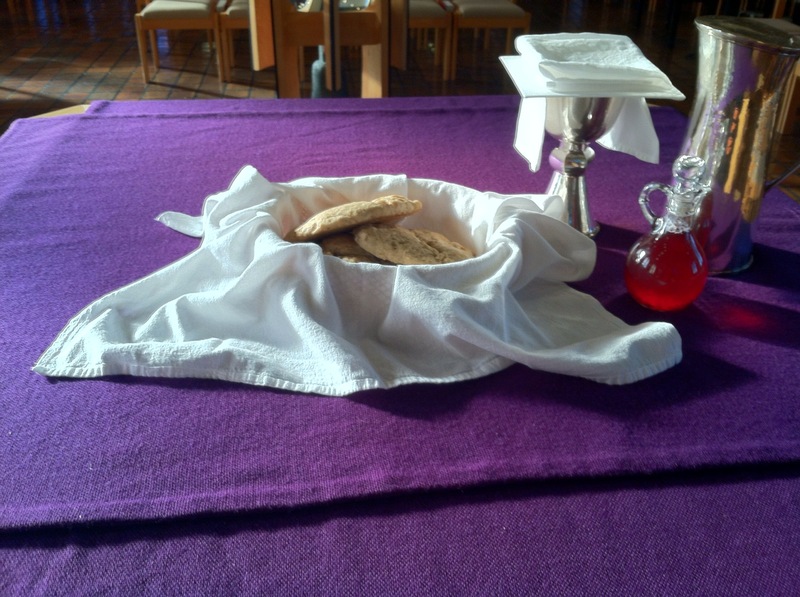 Another blogger’s great view (& some practical instructions) for offering gluten-free communion! Do you have any suggestions to add? Do you predict other challenges? Please share your experiences! When I first started considering baking gluten-free bread I researched what others had already done, and found very limited resources. One refreshing post I did find was this one from the Windy City Cooking blog. I loved that she shared her heart and passion and her story about attempting to safely participate in communion at her church. I also love that she shares what has worked for her and her congregation. Oh, and I loved that the recipe she shares is one I am familiar with, as I follow that particular food blogger, Brittany at Real Sustenance, and make her recipes all the time! And, the recipe is adapted from the Easy Gluten Free/Vegan Quick Bread Base with Endless Flavor Possibilities recipe which is my 8-year-old daughter’s favorite thing for me to break (we just call it “pear bread” though as we began by making it with pears). I have made this recipe many time, with many different gluten-free flour blends and it has always turned out. The taste and texture will vary by what flours, fruit(s) and milk you use (I highly recommend coconut milk from a can). At times it can be crumbly though and if I didn’t have testimony saying it worked well as a communion bread I would suspect many variations would be too crumbly for easy distribution. With a small group versus a large congregation this would be less of an issue however. I also think this quick bread does best baked in smaller loaves. I use my pampered chef 4 loaf stoneware that bakes 4 small loaves at one time. I also line the pans with parchment paper. If I ever use this recipe as communion bread, I will let you know what specific variation I used, and I would love to hear from you if you use this recipe as well! Considering that I cannot share this recipe without linking back to another “inspiration recipe” it may not seem like I did a lot of work to get to this point, but rest assured my baking notebook is filled with failed attempts. After a weekend of multiple failed attempts, I decided I did not need to start out by reinventing everything from scratch, especially since my goal is to not have inexperienced bakers be afraid to attempt this at home! Prepare baking sheets or stones by placing parchment paper over entire surface. Place flour in very large bowl and create a well in the middle to pour all of the other ingredients into. Add all other ingredients and mix well. I find mixing this by hand works fine, but you may use a stand or hand mixer as well. The texture will be very different from other types of bread (almost goopy or sticky). However, when it is well mixed you will notice the text start to “come together” and change a bit, and this is when you can stop mixing. I find this takes about 3-5 minutes when mixing by hand, but you may be more efficient than I am! I find it easiest to use disposable plastic gloves to make the loaves. Either way it is helpful to oil your hands before beginning to scoop the dough onto the baking sheets or stones. I use two small/average handfuls of dough to make one round loaf of this bread. Simple scoop onto the baking sheet and then smooth out a bit. I usually fit three round mounds onto each of my two baking stones. Then cover with flour sack towel or loose plastic wrap and allow to rise for about an hour. (I am experimenting with a non-rising version as well.) I generally use my warm (not hot!) oven to do this. I have also allowed it to rise prior to shaping into loaves and I find doing the shaping first is more effective. 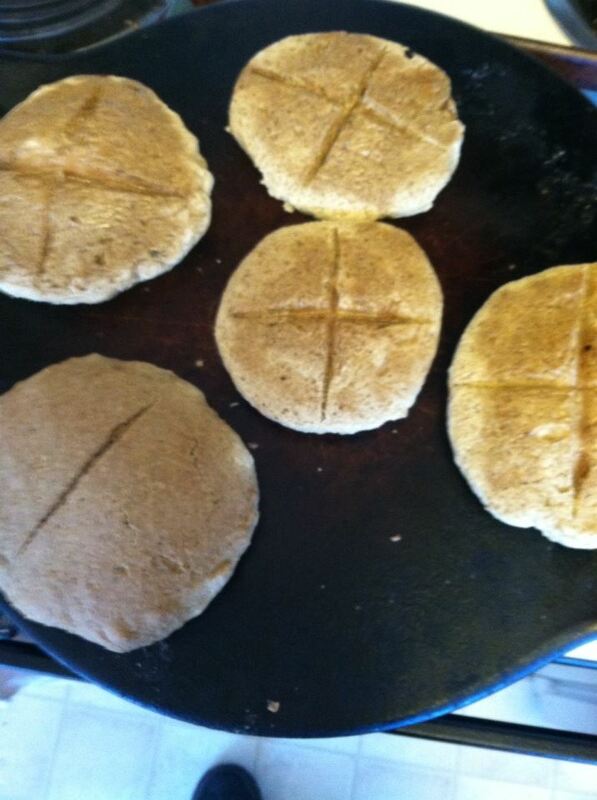 Go ahead and score the loaves now if you want (I do one simple cross pattern on each round). You will likely want to re-score them halfway through the baking time. Bake 16-18 minutes. Remove from oven briefly, re-score if desired, and lightly coat with olive oil before returning to the oven, and bake another 18-20 minutes. total baking time is 36-40 minutes generally and for me depends on what rack in my oven the bread is baking on. Remove from oven and let cool! Please also notice that the directions include using parchment paper. This helps both with the bread not sticking at all and with any possible cross-contamination coming from the pans. Even though the stoneware I use for baking has never touched gluten, I still use parchment paper every time I bake this bread. For both cross-contamination reasons (more on that in future posts) and general hygiene please make sure all equipment and hands are clean while baking the bread, and use only clean (gluten crumb free!) containers to transport the bread. PLEASE, please, please let me know how it turns out if you attempt this recipe! 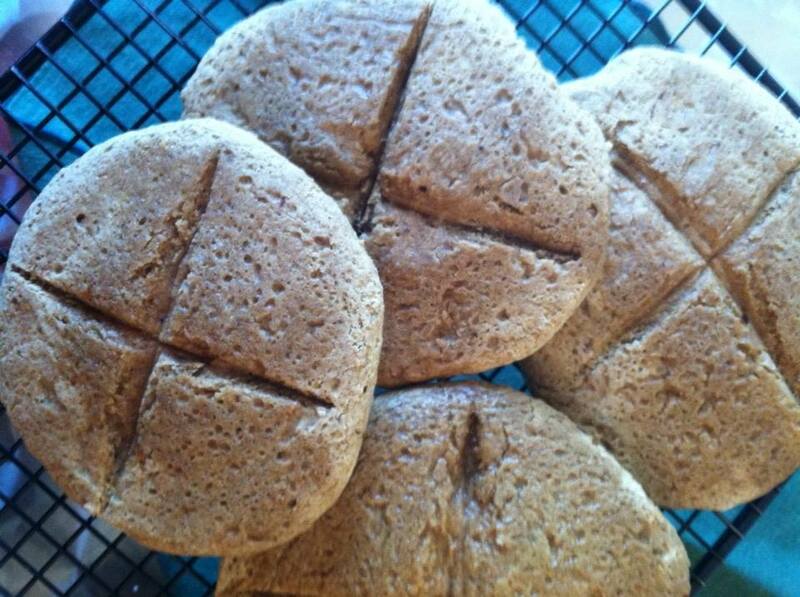 And, as always, please share your experiences and what you are looking for in a gluten-free communion bread recipe. It’s time for me to start sharing what has been happening in my kitchen. For the last several months I have been baking with a purpose. My goal is to ultimately develop several simple gluten free and allergen friendly bread recipes that can be used during Holy Communion. Please understand that I am not a professional baker (not even close! ); however, I hope to eventually collaborate with some that are willing to share their expertise here. What I am is a Lutheran theologian passionate about inclusivity and hospitality. I also happen to be strictly gluten free for health reasons. I may share more of my own story while sharing recipes (and likely a little theology), but the star of this particular blog will be the recipes and related information. All will be as allergen-friendly as possible. I do not think it is OK to remove one allergen (gluten) and replace it with one or more other common allergens (such as eggs and nuts). All will taste good. I do not believe that consuming GF communion bread should leave a bad taste in your mouth! It is an experiential sacrament after all! In addition to my personal recipes, I will look for and share what others are doing in order to be inclusive of those with food allergies and sensitivities during Holy Communion. While the focus will be on practical tips and recipes, I will also include personal stories of how meaningful such inclusion can be — if you send them to me!